How To Light Your Wood-fired Pizza Oven With The Help Of A Little Jenga! Love playing Jenga? Well, if you do, you’ll probably be a dab hand at lighting a wood-fired oven. The process of lighting a wood-fired oven is something people can worry about, but once you’ve mastered the skill – in just six simple steps – you’ll find that it really is child’s play. If you’re ready to tackle this, follow our Six Simple Steps to Lighting a Wood-Fired Pizza Oven, as detailed below. Ready-to-burn certificated wood (kiln-dried) or compressed virgin beech logs. Take a few pieces of kiln-dried, ready-to-burn kindling. Position the first piece in the centre of your wood-fired oven and then arrange the others in a criss-cross Jenga-style way. Prepare your firelighter. Be aware that there are various kinds of firelighter available, including some that are non-toxic, such as Warma or Logs Direct firelighters. These are made of wood wool and natural oils. Avoid paraffin-based lighters like those coming in white blocks. Light your firelighter, following the instructions provided with it and place it in the centre of your Jenga-style pile of kindling, ensuring it will be able to set the kindling alight. Once your fire is started inside the oven, gradually build it up. Choose some smaller pieces of kiln-dried (ready-to-burn) wood and let that set alight. As the fire grows, add larger pieces of kiln-dried wood/logs. This will allow the fire to burn slowly, building up as you want it to. It is always a good idea to put the next piece you intend adding into the mouth of the oven, so they are already warm when you add them to the fire. You will find that they then ignite faster and add energy more speedily. Keep your fire stack in the centre of the oven until the oven is up to temperature. You can assess this by watching the top of the oven. At first, it will be sooty, but as the heat increases, this will start to disappear. When you see a white spot on the top of the oven, you should know it is up to temperature. Alternatively, you could use a thermostat gun, pointing it at either side of the dome, to get a reading. If you have a small oven, it should reach the optimum temperature in around 20 minutes. If it is a larger oven, you should have it up to temperature in around an hour. Now, reach for your metal peel and move the fire to the side of the oven. Don’t always put your fire on the same side; it is better for your oven if your alternate the fire’s position each time you use it. Now, your oven is ready for your food, whether you wish to cook pizza, roast vegetables, bake potatoes, or create something else. 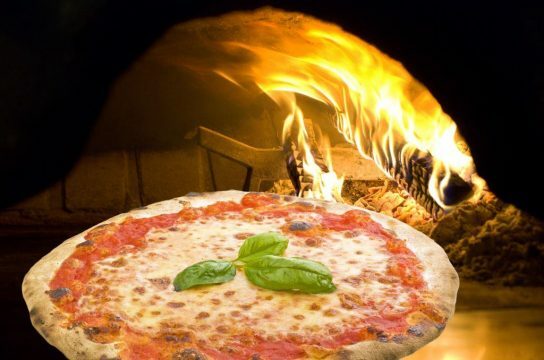 If it’s pizza, it will cook in a matter of minutes. If you are cooking food for longer, add logs as necessary, to keep feeding the fire. As the Italians say, “facile”.